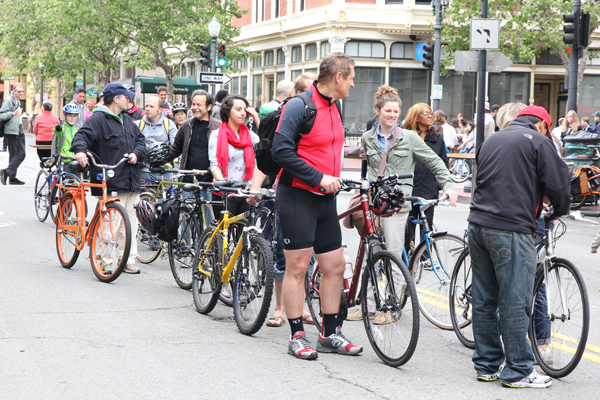 This year is Bike To Work Day’s 20th Anniversary. 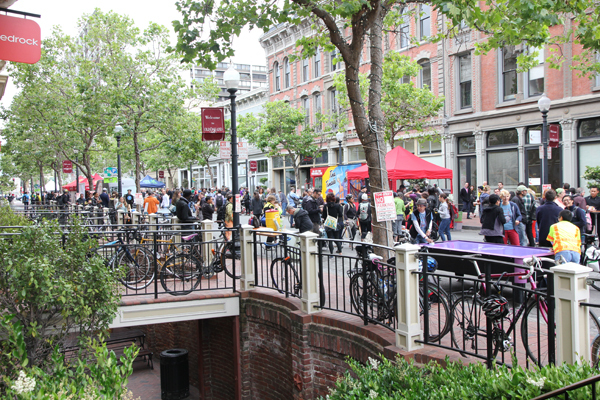 Bike To Work Day (BTWD) strategy is to encourage bicycling as a non-polluting and healthy commute option. These are pretty much my two reasons why I bike. 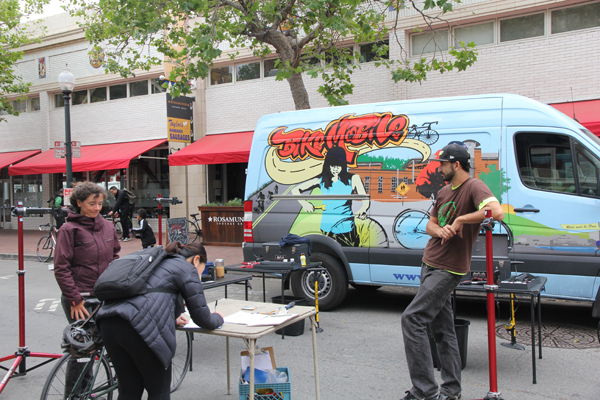 To make it easy and encourage newbies, there are dozens of Energizer Stations (some with free bike repairs) located everywhere. 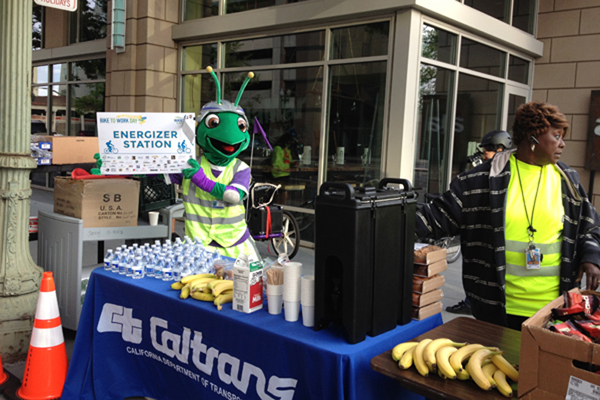 These stations are locally sponsored and have free stuffs from bagels to chocolate chip cookies to coffee (and bananas). What’s great about these stations is that each station is sponsored by a different venue and you can chat with the employees that volunteer for that day. 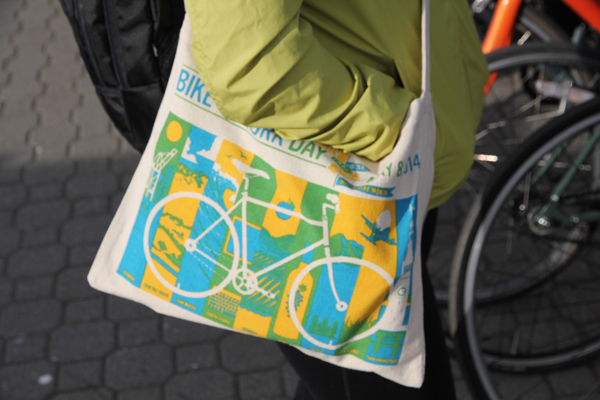 BTWD bag for everyone that stops by an Energizer Station via bike. It has some goodies inside. Caltrans station in front of my building. I am glad this biggest transportation agency recognizes biking as an alternative to driving. They are “evolving”, I guess. Here were my two companions for the ride at Oakland Public Library station. Kelly and Jesse. It was Kelly’s first time bike commuting in Oakland. Good for her! 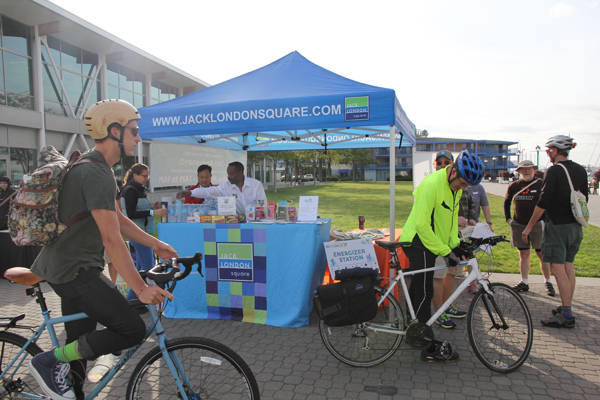 Here was the tourism agency station at Jack London Square ferry terminal. This was where we got on the ferry ride over the bay to South San Francisco for work. 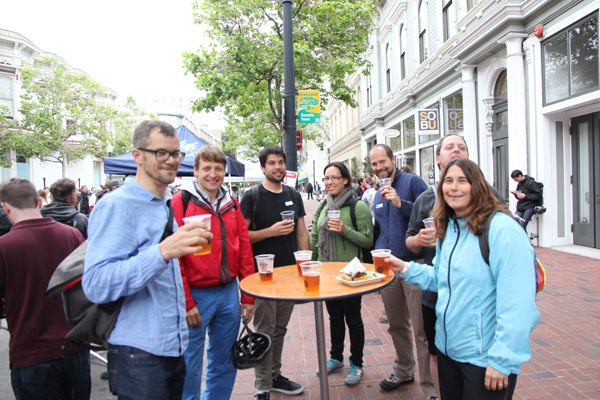 So in the evening, my ferry/bike commuters all went to the Bike Happy Hour Party in Old Town. 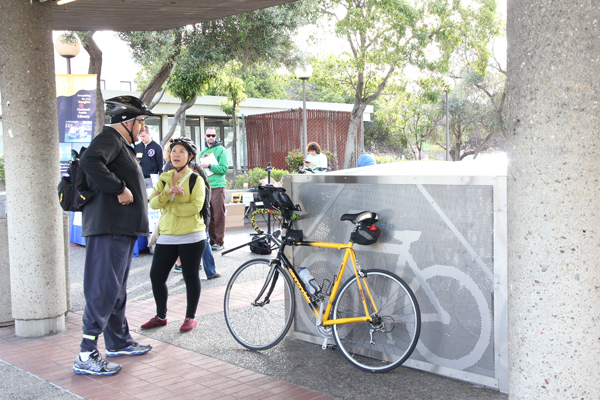 It was hosted by Bike East Bay coalition. 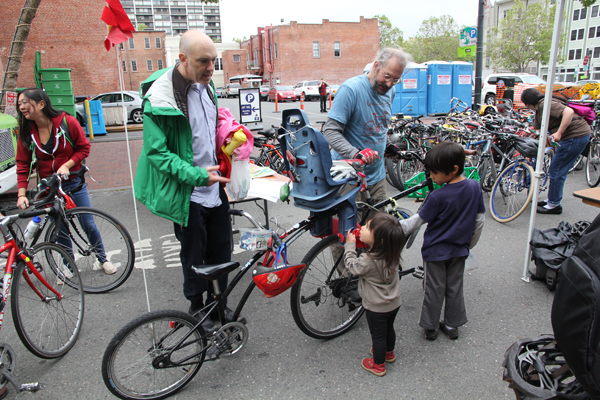 Free bike valet parking at the Party. 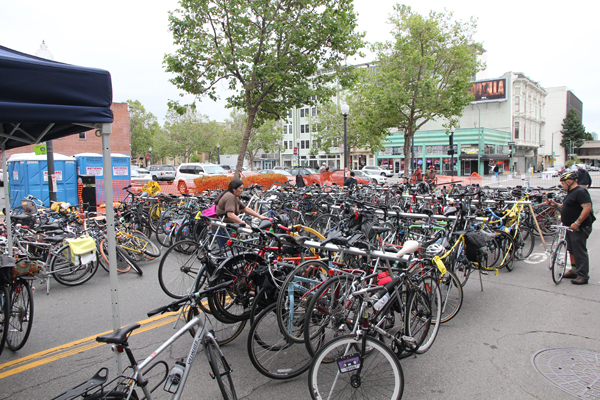 Thank you bike valet! It looked like a line for beers but nope, it’s a long line for bike valet. Kelly got a flat tire on her first day of commuting. I hope this is does not discourage her from biking to work. 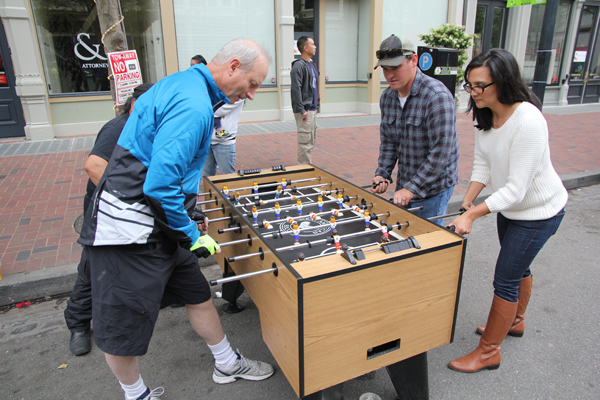 Who does not like foosball?! 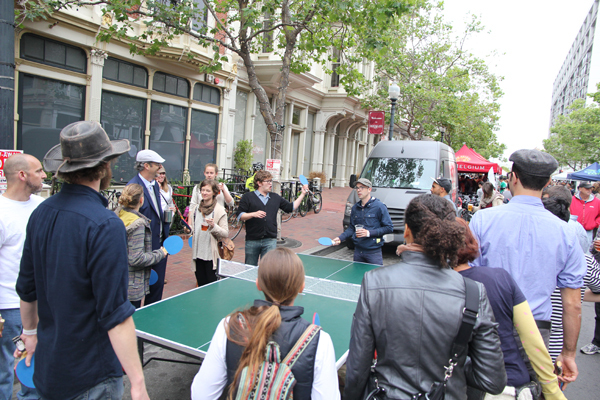 Too many people wanted to play ping pong, so everyone got a paddle and took turn hitting the ball one at a time. LOL! People were just having too much fun! Here are my bike/ferry commuter friends. Thanks Mike (the guy in blue jacket) for the beer! Rob Prinz, Bike East Bay’s education director, training for the Climate Ride…really. 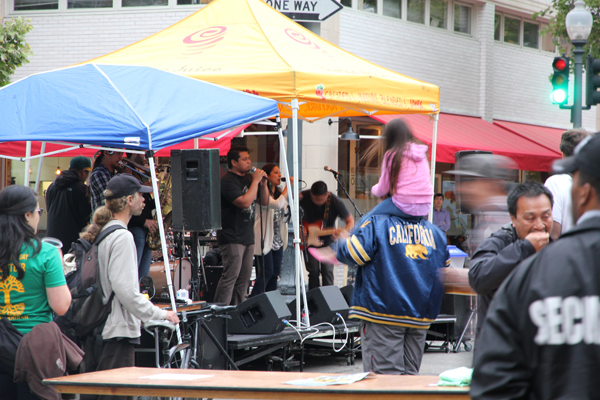 A party is never a party without live music. 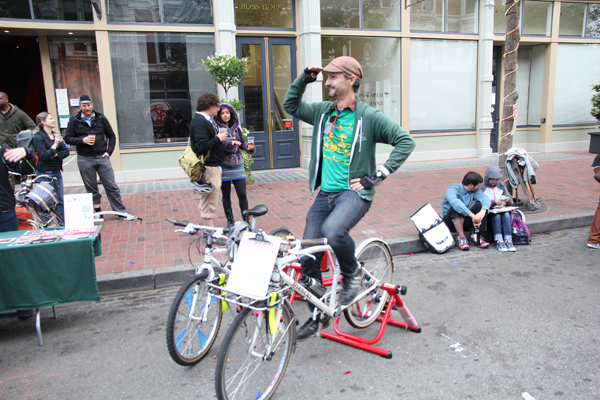 I really enjoyed this year’s BTWD. Next year, I am planning to take the whole day off from work and visit every Energizer Stations. Sounds like a good plan? For all those who are new to bike commuting on May 8th, I hope it’s a beginning of many more bike commuting days for you.